You love bringing the latest gadgets with you in your car. But how are you supposed to keep your gadgets powered up and ready to go? You’ll need a power inverter, of course. Purchasing a power inverter for your car might seem like it is fraught with difficulty, however. Aren’t all power inverters for the car more or less the same? As it turns out, there are a bunch of differences between car power inverters. In this article, we’ll walk you through five of the best power inverters for your car so that you will know which one might be right for you. We’ll also discuss a few of the important features that you’ll need in a car power inverter. 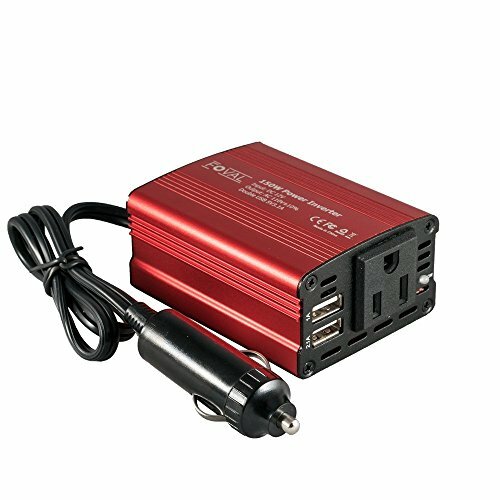 What Should I Look For In A Car Power Inverter? How Long Should My Car Power Inverter Last? What Capacity Does My Car Power Inverter Need To Be? How Do I Avoid Blowing The Fuse On My Power Inverter? Should My Car Be Running While I Use A Car Power Inverter? The BESTEK 75W Power Inverter DC 12V to 110V AC Car Inverter with 3.1A 2 USB Ports is a great power inverter which caters to whichever way you’d like to power up your devices. The BESTEK power inverter comes equipped with two USB ports and one standard wall-outlet style port. This means that you should be able to charge as many as three separate devices at the same time. This power inverter also has a few special features which help to preserve your devices and also the inverter unit itself. As power inverter units tend to heat up when there is a lot of power going through them, there is a fan which disperses the heat. Aside from the fan, the unit also has an auto-shutdown feature. If there’s about to be a power surge or any other issue, your devices will be protected. Likewise, your car battery won’t get drained. 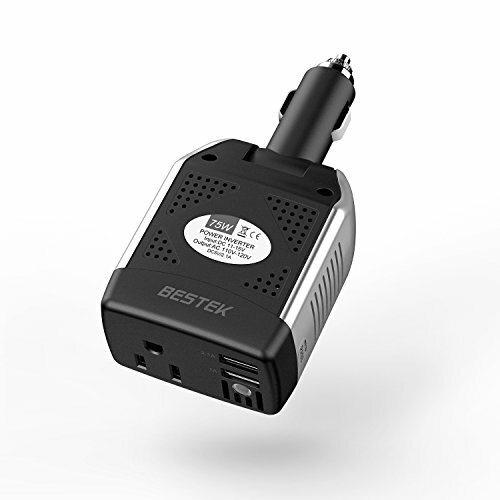 The BESTEK 300W Power Inverter DC 12V to 110V AC Car Inverter with 3.1A Dual USB Car Adapter is the bigger brother of the BESTEK inverter in our last review. This inverter is ready for heavy duty applications, provided that your car battery can handle the load. The 300W power inverter by BESTEK has two USB ports and two standard wall-outlet style ports. This means that you can power an additional device with this unit compared to the other one. Because this inverter can accommodate an additional device, it’s a bit bigger than other power inverters for your car. It’s still about the size of a smartphone. The 300W inverter has a few unique protection feature which are necessary for its throughput. There’s a 40-amp fuse which will blow in the event that you put too much load on the inverter. This will keep the inverter safe and extend its lifetime. The unit also has a “fast charging” ability which can sometimes be at odds with the fuse. While it is entirely possible to charge your laptop very quickly using the fast charging feature, you may find that it causes a frustratingly large number of fuse trips. Resetting the fuse is easy, but you’ll still have to flip it each time. The Foval 150W Car Power Inverter DC 12V to 110V AC Converter with 3.1A Dual USB Car Charger is a credit card-sized inverter which will fill most of your needs without a hassle. Foval is a well-known name in the power inverter world, and it’s no secret why. Foval creates high quality power inverters which are extremely inexpensive. This power inverter is no exception. While it manages to be a bit smaller than most other three-device-capable power inverters, the unit is very reliable and is capable of a 150W throughput. While you will still struggle to inflate an air mattress using the power from the inverter, the Foval inverter has a perfectly calibrated fuse which won’t blow unless you really push the unit beyond its limits. You won’t be wasting much time flipping the fuse back. Finally, the Foval inverter has a very quiet cooling fan which you won’t notice, especially when your car’s engine is running. It’ll be like it doesn’t make a noise at all. 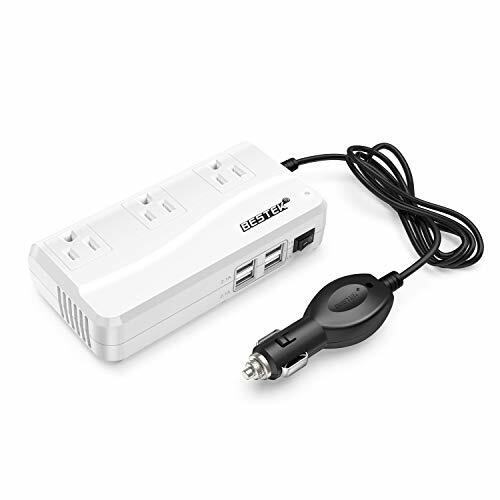 The BESTEK 200W Power Inverter DC 12V to 110V AC Inverter with 4.2A 4-Port USB Car Adapter is the car power inverter for people who have an entire vehicle full of people with devices that need charging. For family road trips, this is the right power inverter. 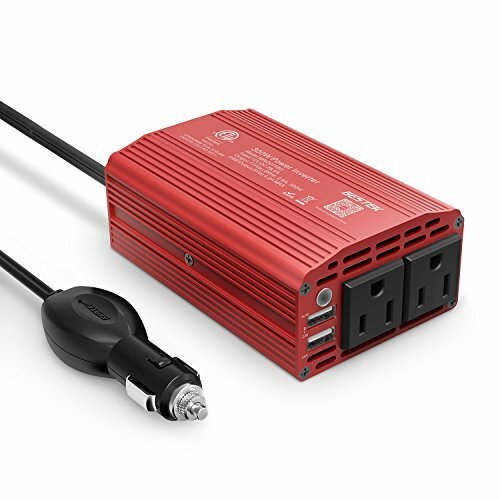 The 200W BESTEK car power inverter has three separate 120V wall outlet ports and four USB ports. This means that you can charge an entire family’s worth of devices without a problem — so long as no single device demands too much electricity. For small devices like Kindles or smartphones, you can really get the most out of this unit’s capacity. For larger devices, you’re more or less limited to one or two if you’re lucky. You may still have to rotate which family member gets to charge their laptop. Nonetheless, this power inverter can ease a lot of the pain of having to unplug and replug everyone’s charging cable throughout a trip. Furthermore, the fuse on this model is fairly resilient, so you won’t need to worry about being constantly bothered by flipping it. 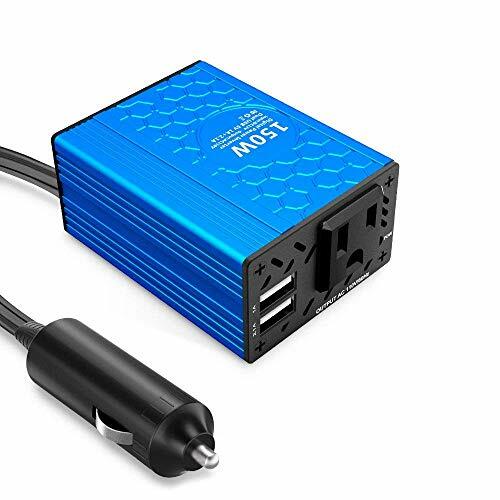 The VOLTCUBE 150W Car Power Inverter 12V DC to 110V AC Converter with 3.1A Dual USB Car Adapter is a trendy and capable car power inverter which will feel right at home in your sports car or sport utility vehicle. The VOLTCUBE’s aesthetics are not to be ignored. The bright blue brushed metal exterior stays remarkably cool while charging, and it’ll make a great companion to the rest of your car’s interior. The cord which attaches to your car’s cigarette lighter port is substantially long, so you will have an easy time if someone in the backseat needs to charge their device. The VOLTCUBE is powerful enough and has an effective enough fuse to run air compressors, which is remarkable because most car power inverters don’t. You can take your air mattress along for the road trip and not worry about your fuse blowing while using the inverter to power. Now that you’ve seen a bunch of the best car power inverters on the market, it’s time to discuss the best features that car power inverters can have. First, your car power inverter needs to be able to charge your devices. If you want to charge your phone, a car power inverter with a small wattage might be the right choice for you. On the other hand, if you would rather use your car power inverter to charge your laptop or power a pump, you will need a larger wattage. For the most part, there is no disadvantage to having more wattage than you need. You can get a rough idea of the wattage you need for your car power inverter by reading the electronics sticker or imprint on your devices. Aside from the wattage, you’ll also need a car power inverter which can charge as many devices as you would like. Most are limited to fewer ports than a power strip, so you should consider the capacity carefully. USB ports can count toward the capacity, so you will probably have to settle for a combination of USB ports and 120V wall-equivalent outlets. Your car power inverter will need to disperse heat effectively. Most car power inverters have a small fan which will remove heat effectively. Your car will warm up slightly as a result. More sophisticated car power inverters will disperse the heat internally first using heat sinks. Heat sinks are rare to find, but they help to prevent your car power inverter from overheating your car. The inverter itself will become slightly warmer as a result. Weak car power inverters will have fans which allow the unit to overheat. When the unit overheats, it is unlikely to stop functioning immediately. It may, however, become too hot to touch. Furthermore, the added heat will put stress on the inverter and cause it to fail sooner. Most car power inverters are not made with a high quality build, so they will fail as a result of heat absorption relatively quickly. The best car power inverters will last for five or six years, however. Finally, your car power inverter needs an effective fuse. The fuse protects your devices from jumps or drops in voltage, and it also protects the power inverter itself from being a conduit for more power than it can handle. A weak fuse can lead to a lot of problems because it will get blown frequently with normal use. On the other hand, a great fuse will let you use the inverter right up to its maximum wattage very consistently. Flipping a fuse that has been blown is not a big deal — it typically only takes a flick of the switch — but when you are driving it can be an added hassle that you do not need to deal with. The answer is that it depends on the quality of the power inverter. For the most part, car power inverters are not very durable. Most are limited by their fan or their fuse more than their other parts. The more frequently the fuse gets blown, the more stress it experiences. Eventually, it may not reset properly. Similarly, the more you put your car power inverter under a heavy load, the more it will heat up and need to run the fan. The longer the fan is running, the sooner it will break. It isn’t worth replacing the fan once it breaks, so the fan typically determines the lifetime of the power inverter. Larger capacity car power inverters tend to serve people better than smaller ones. So, a 300W power inverter will probably be less frustrating for you to use than a 150V inverter. More throughput typically puts a higher load on your car’s battery, but it will also save you the hassle of needing to flip the fuse most of the time. Higher wattage also means that you can successfully charge more devices at the same time. Blowing the fuse on your car power inverter is nearly guaranteed at some point in time. The easiest way to avoid blowing the fuse more often is by charging fewer devices. Aside from reducing the number of devices, you can also charge devices that require less power. You can choose to run your car or leave your car off while using the car power inverter to charge devices. Be aware that if you leave your car off, using your inverter will drain your car’s battery. Some inverters won’t run if your car is off, however. For those that do, you can potentially drain your car battery and leave yourself without enough power to start your engine.